This is the first Topps Cubs card that...what? Shows a player with the first name "Cuno"? 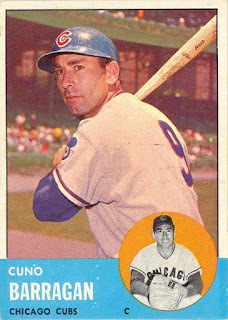 Nope, because Cuno had a card in the 1962 set. 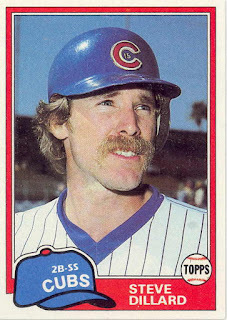 This is the first Topps Cubs card that shows a player wearing a batting helmet. 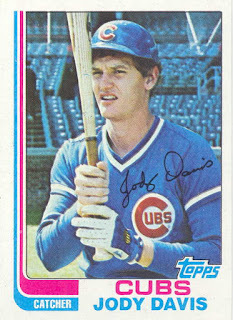 With all of the pictures on Topps cards being posed, all the ones showing a player as a hitter were taken with the player wearing his regular hat No one bothered to grab a helmet to look more like a real hitter. 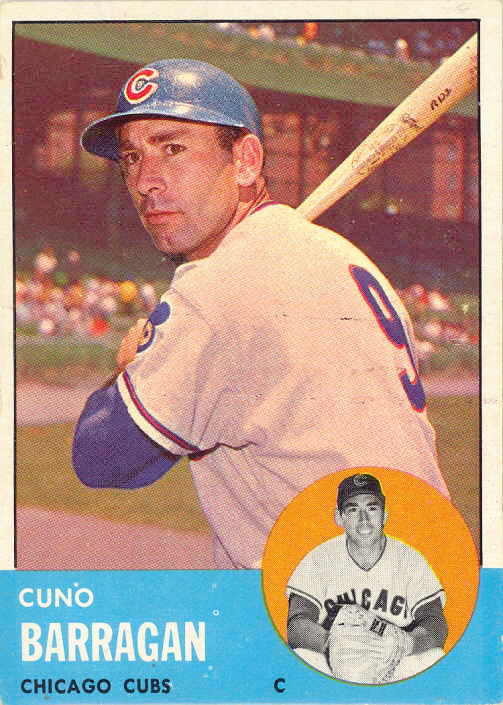 But sharp Cuno stuck his helmet on before the picture was snapped and in 1963 we finally get to see a Cubs batting helmet. Notice that even back then, they used a raised felt C instead of a decal. They still do the same today, one of the few teams not using a decal. Also if you look very carefully you can see the #9 painted in white inside the C. The Cubs helmets had that feature for years. Players didn't have to look on the back of a helmet for a number, it was right in front. That tradition ended years ago and now they have numbers on the back like everyone else. It looks like the little white numbers disappeared in 1981. 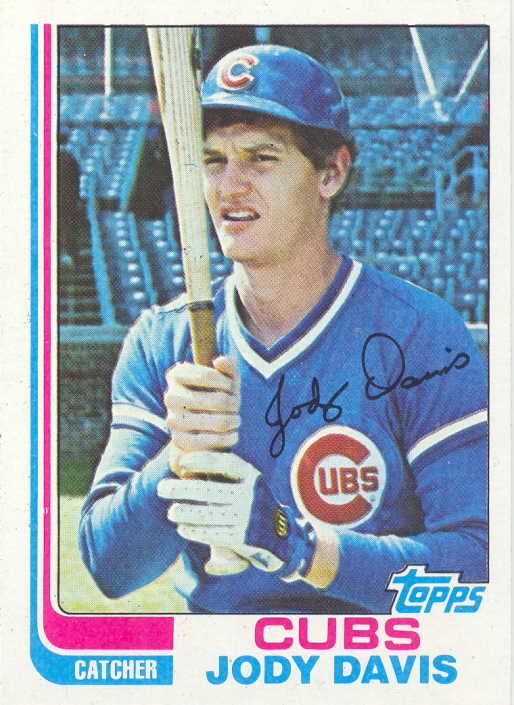 The 1981 Steve Dillard card shows a number (picture taken in '80) while Jody Davis' 1982 card is numberless. I'd love to see that unique feature come back. I recall hearing that long time clubhouse manager Yosh Kawano was responsible for writing in the numbers. Here's a follow-up for you. 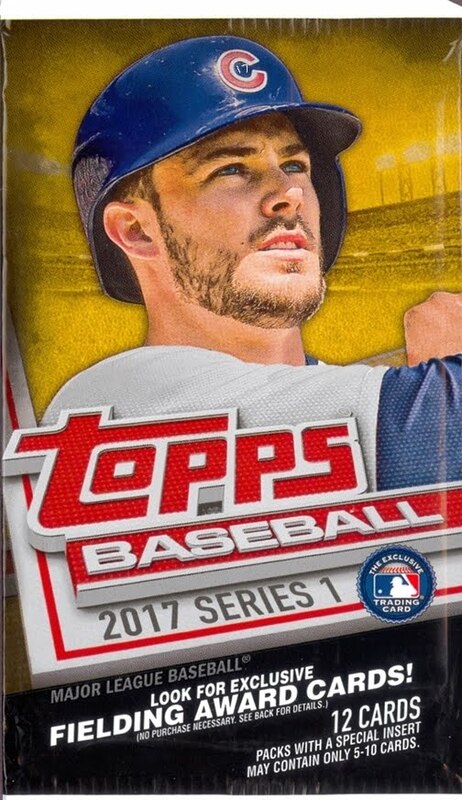 Are there any cards that clearly show players wearing the wrong helmet? I too remember that it was Yosh that did the numbers. Great follow-up question! I'll do some digging around and have something on Monday. I didn't know about the numbers on the front. Cool. I remember as a kid digging the batting helmets and the practice of players putting the helmet on over their regular cap. I seem to recall sometime during the 70s maybe 80s was when the ear flaps appeared on the helmets. I've always loved the felt "C" on the Cubs helmets. I just read this morning that the Cardinals have joined the Dodgers in using a raised plastic logo on their helmets. It's a good look, I wouldn't mind more teams going that way. Who Is In the Team Photo?